Singapore is a small country in Southeast Asia. It is located just one degree north of the equator at the end of the Malaysian penisula. The entire country covers just 250 square miles*, but nearly 4 million people live there (about one fifth of them are foreigners like me). *For reference, Wake County NC covers 856 square miles. New York City is 378 square miles, Manhattan is 26 square miles. Disney World in Florida is 43 square miles. Cary NC is 43 square miles. 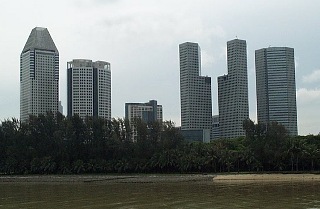 Singapore is a small island at the tip of the Malaysian Peninsula. 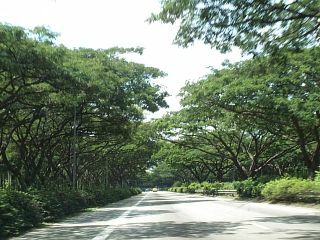 Singapore's weather is hot and humid year-round. The temperature usually ranges between 73F (23C) at night to 86F (30C) in the daytime and the humidity averages 84%. Most of the people (76%) are ethnic Chinese, 15% are Malay, 7% Indian and 2% "other". English is the official language, and travellers who only speak English will feel welcome. However, you'll encounter a lot of the other native tongues as you travel through the city. Many years ago, Singapore was called Temasek. In the 1600's, the King of Palembang was visiting Singapore when he saw a beast in the jungle. He asked an aide what type of animal it was, and the assistant suggested that it was a lion. 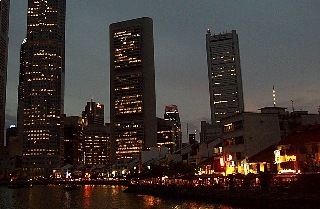 Since then, the island has been called "Singapura" or "Lion City". A British explorer named Sir Stamford Raffles founded a colony in Singapore in 1819. Its strategic location secured the Straits of Malacca from the ever-present threat of Dutch occupation. The island remained under British control until World War II, when the Japanese invaded. After the war, the island returned to British rule, but the inhabitants wanted independence. The British were not willing to grant Singapore their sovereignty, but they allowed it to join neighboring Malaya in the formation of a new state called Malaysia. A few years later (in 1965), Malaysia granted Singapore the sovereignty that it desired. 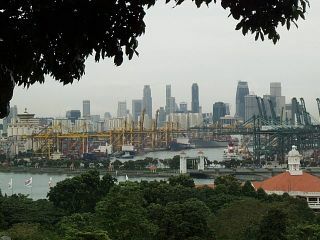 Today, Singapore is a "City State" (a city-sized country like Monaco or the Vatican City). Singapore is a Republic with a unicameral (one house) parliament. General elections are held every five years; and since 1965, a single party called the "People's Action Party" has been in power. Much of Singapore's personality can be attributed to Lee Kuan Lew, who was Prime Minister from independence until 1990. Since then, Lee's successor, Goh Chok Tong has held the office. Dr Lee still acts as Senior Minister. The city is modern and clean. There is a busy shopping area near the south central area of the island, and there is a subway system that links the outer residential areas to the city. At the extreme southern tip is the world's busiest shipping container port. When I first announced that I was going, I heard a lot of the same comments over and over. I guess people thought they were being witty when they told me "don't chew gum there or they'll cane you". It got old very quickly. Most Americans know very little about Singapore, except that there is a general ban on chewing gum, and that an American diplomat's son got caned (beaten) for vandalizing cars in 1993. In fact, Singapore is a very safe and modern city. Its strict laws make crime almost nonexistent, and thus make it a safe place for families. I think the US could learn a few lessons from Singapore. Michael Fay spray painted cars in Singapore, and he was punished with a painful spanking with bamboo canes. Considering that Singapore is the most expensive country in the world to own a car, they consider it important to defend against senseless destruction of a family's most valuable asset. Fay whined to his daddy (a diplomat), who called the US president, who called the Singaporean leaders, who reduced his sentence to a single stroke. Fay later appeared on such ?reputable? television shows as Geraldo and Donahue to speak out against human rights violations. I think Fay had a few good spankings coming to him. In the west, it is seldom mentioned that the car that Fay spray painted belonged to the court judge... talk about stupid. The chewing gum ban started when teenagers put chewing gum on the sensors on the subway car doors. The doors would not shut and the trains would not run, causing huge congestion problems. So it is now illegal to IMPORT or SELL chewing gum, but you may keep your own supply and chew it without fear of being fined (as long as you throw it away properly -- duh). The other popular comment I get a lot is "Singapore is a fine city". This is the country's unofficial slogan. In the 1970's and into the 80's, there were strict fines on everything from jaywalking to "not flushing". Soon, some enterprising individuals started to sell T-shirts that summarize the list of fines, claiming what a FINE city it is. The reason for all of the fines is that in the 1960's, the inhabitants of Singapore were a filthy and uncivilized bunch. The government knew that the quickest route to prosperity was to invite multi-national corporations to set up office in Singapore. But what western company would set up shop in a town where they spit on the sidewalks and pissed in the elevators? The quickest way to motivate the mostly-Chinese population was to hit them hard in their pocketbooks. And it has worked. Today, Singapore is about as clean as Disney World, even though it is about the size of New York City.